It took the statisticians of the National Bureau of Economic Research almost a year to confirm what the rest of us already knew, that the US registered a significant decline in economic activity, thus officially entering a period of recession. While I am pleased that the members of NBER take their duties seriously, thereby ensuring that they don’t leap to any hasty conclusions, I only wish that similar moderation could be displayed by their colleagues at the Fed and the Treasury. Unfortunately, the facts prove otherwise. Three months before the recession was officially declared, Paulson and Bernanke have embarked on the largest bailout program ever conceived with the blessing of a lame-duck president and a complicit Congress – a program which so far will cost taxpayers $8.5 trillion. This staggering sum encompasses: loans backed by worthless assets ($2.3T), equity investments in bankrupt companies with negative net worth ($3.0T), and guarantees on crumbling derivatives and other hollow collateral ($3.2T). Back in September I was stunned that Paulson was able to make his case and win the support of Congress for a $700 billion bailout package (more than the total war spending in Iraq to date). How could Americans (or more accurately, their representatives) agree to give such a broad mandate with so few checks and balances? Have we become completely numb? While I realize that many of our compatriots have been running large credit card balances and interest-only mortgages with little thought as to how they would repay their debt, one would expect a little more restraint when dealing with the financial future of the largest economy in the world. 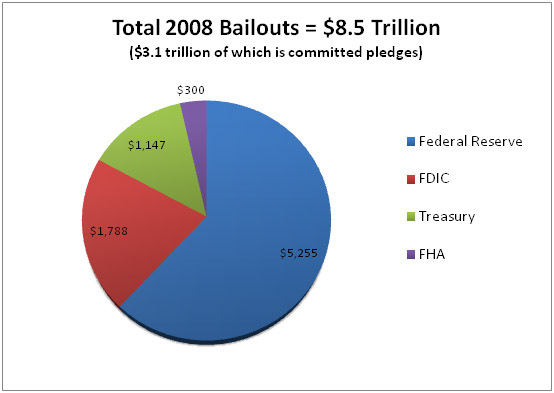 Operating under the assumption that our largest financial institutions are “too big to fail”, in the span of a few weeks we went from pledging to spend $1 trillion to $3 trillion – a commitment which then grew to $5 trillion before ballooning to a staggering $8.5 trillion. At the rate we are going, we will be dealing with double digits – in trillions- before the end of the year. And while all off that money is not yet spent, make no mistake – these are real commitments with serious liabilities attached to them. I have heard the argument that an equity infusion is not the same as spending money. While I would agree that in an arms-length transaction this might actually be the case, our government is definitely paying a large premium. What is the real value of Citicorp or AIG? Since they are quasi-bankrupt (and would be totally bankrupt without massive injections from the Fed), a reasonable businessperson might pay a token price for their equity and the assumption of their enormous liabilities. Before doing so however, a buyer would have to see some significant value in buying these entities as a continuing business. In most cases, a buyer would not want to assume the company’s liabilities but would prefer to buy selective unencumbered assets in a bankruptcy proceeding. Any money our government pays above what a reasonable person would pay in an arms-length transaction is real spending and should more accurately be called a grant. While defenders of the too-big-to-fail policies argue that providing guarantees is not the same as granting money, the reality is that these guarantees are necessary to prevent the collapse of financial institutions currently lacking the necessary collateral to meet their loan covenants. Should their loans be called, we could actually find out the real value of their assets. The fact is that in-spite of Paulson’s and Bernanke’s efforts, deleveraging is already happening. Although at a slower pace, one asset class after another is being adjusted down towards its intrinsic value, which is usually not much. Make no mistake; many of these guarantees will eventually be called in by lenders. In due time, unless our government is able to inflates its way out of this bottomless pit, it will have to honor most of these guarantees. 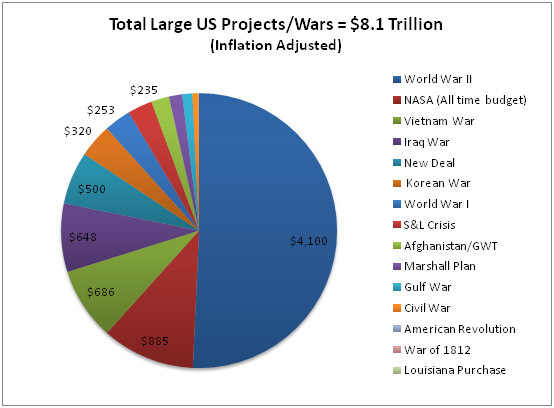 The best deal ever for a government program was the Louisiana Purchase, a deal with the French that gave us 23% of the surface of today’s US for only $15 million ($284 million in today’s dollars). Why couldn’t Paulson and Bernanke display the financial acumen of a Thomas Jefferson? How will our country repay its debts? The current bailout represents 62% of our GDP. Our current deficit of almost $11 trillion may exceed our GDP next year. Recently the Treasury has been able to place new debt; investors have liquidated equities and bonds and sought refuge in the relative safety of the dollar and government bonds. As we move forward however, our government will need to attract trillions of dollars annually to fund its programs and commitments. The foreigners who have financed our irresponsible spending for many years will no longer be able to afford it, let alone finance more of our reckless behavior. As a matter of fact, several countries have already announced their own bailout packages to prop up their domestic economy. And, unlike during WWII, when Americans invested their savings to support the war effort and fund our government’s deficit, our citizens are in debt themselves with no savings left to invest. In the near future, the Fed will have no choice but to turn on the printing presses and start operating them around the clock to create the money that can’t be raised in the capital market. These actions will lead to a significant debasement of the dollar and a major appreciation of gold and all commodities (real assets). Once this inflationary cycle starts, foreigners will realize that their investments in T-bills are depreciating rapidly. There will be a massive exodus that will put more pressure on the dollar and on interest rates. Our weakened US economy will be faced with the rising cost of capital and a painful period of stagflation. Trillions of dollars will have been wasted. Our government will have mortgaged America and the ensuing debt will have to be paid by future generations. Not a very bright picture, to be sure, but the Casey Research team strongly believes that there are opportunities in every crisis. Preserving your assets and even profiting in times of crisis by making the trend your friend is the focus of Casey’s flagship publication, The Casey Report. We have helped subscribers get positioned in commodities in the late ‘90s, buy grains in 2006, and short financial stocks 18 months ago… resulting in double- and often triple-digit returns. To learn more about the trends we predicted and, more importantly, the emerging trends we now foresee, click here now.